The latest project, from the people that brought you Daily Bread Waymouth Street, is Raw and Real. Their cold pressed juices are divided into two sections; live juices which are made from fruit, leaves, roots or a combination thereof, and blends, which are fruit, almond or coconut based. On top of that, they have a small selection of sandwiches, rolls and salads which are almost guaranteed to leave you feeling healthy. Unlike other new shops, Raw and Real have gone away from the industrial look and have come up with their own unique style. As with their signage, the use of pegs and timber features quite prominently, and it has the added advantage of providing support for shelving. There is seating at the back, as well as a dozen more on the footpath. 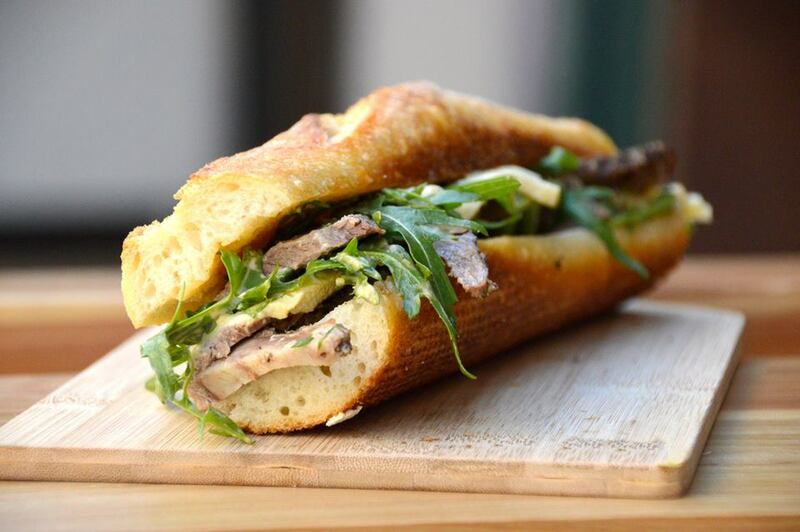 For lunch, I had the Sourdough Roll which contained generous amounts of well marinated, tender, 4 hour slow cooked Angus beef. The meat was so soft and delicate, it simply melted in your mouth. There were subtle hints of garlic that were used in the cooking of the meat. The brie was creamy and buttery, and was well complimented by the spicy mayo which a light burning sensation at the back of my mouth. The rocket was fresh and crisp, as was the fresh crusty sourdough roll. 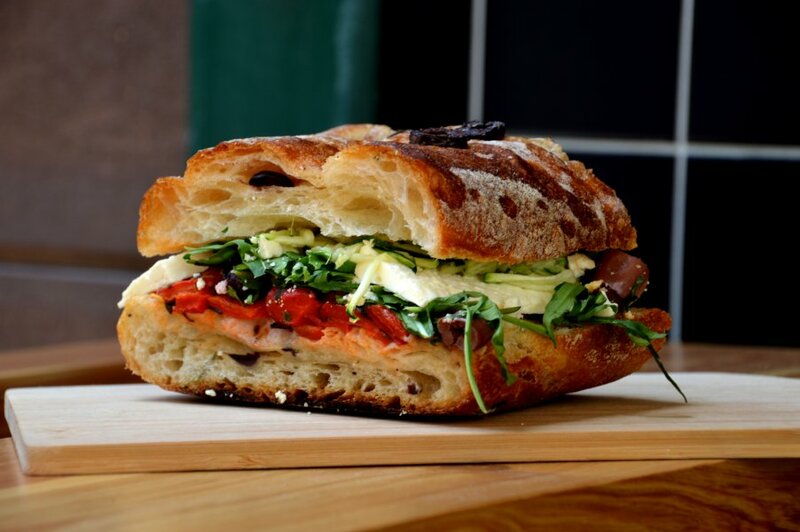 Next I had the Rosemary and Olive Ciabatta with Grilled Vegetables and Feta. The bread was nice and crusty with some wonderful herb flavours featuring quite prominently. The vegetables had a lovely sweetness, particularly from the roasted capsicums, which were balanced by the saltiness of the feta. 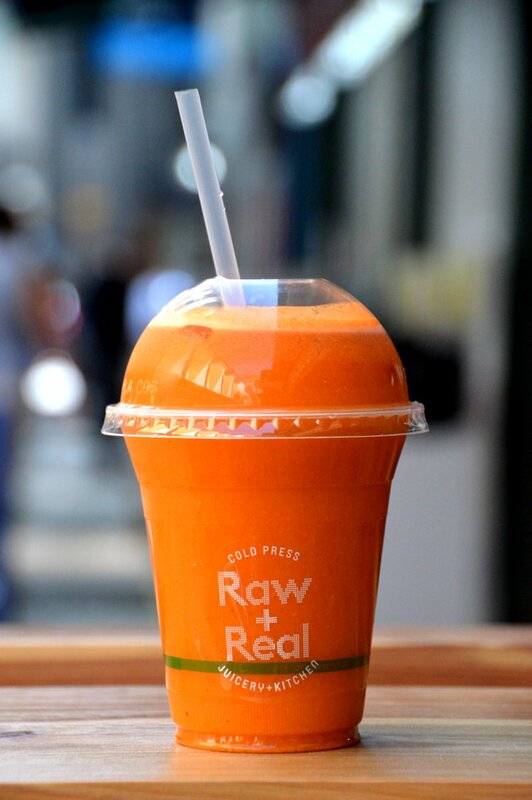 The live juice had a lovely bright orange colour from the carrots and it’s natural sweetness featured quite prominently. The array of other ingredients were in contrast with each other and did well to balance out the flavours. The tartness of the lime, the sweetness of the pineapple and the inclusion of salt and pepper were an interesting mix of ingredients that worked quite cleverly. In the coconut based blend, the sweetness of the pineapple and coconut milk were balanced by the tartness of the berries. The basil was sweet and savoury with a subtle peppery flavour to finish off. The drink was nice and refreshing, and perfect for a hot Summer day. The staff were friendly and welcoming, and the service was fast and efficient. The atmosphere was relaxed as you could sit in one of the outdoor dining spaces and people watch as the lunch crowd passes by. The cost of the sourdough roll was $9.90 which was great value for money considering it’s portion size, quality of ingredients and how tasty it was. All the other salads and meals were around that price as well. 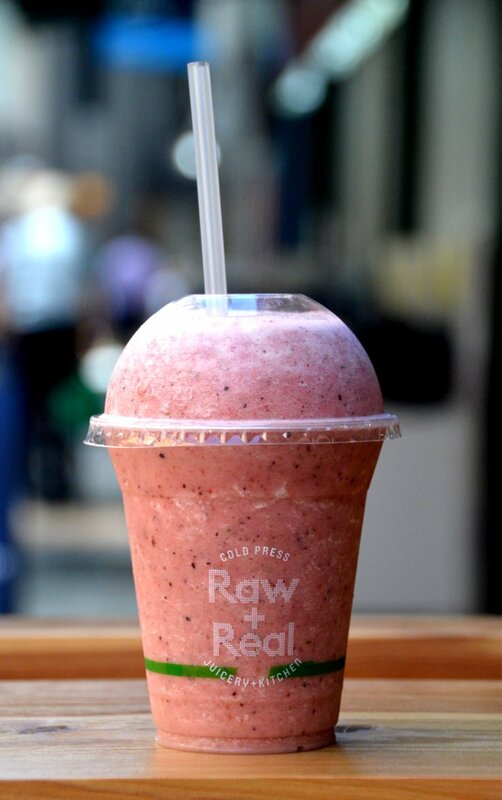 The live juices start from $6.90 and the blends from $7.50, which is an easy and affordable way to get your daily fruit and vegetable intake. In this day and age, people are looking for healthy and nutritious, and offerings that are free from artificial colours, preservatives and additives. 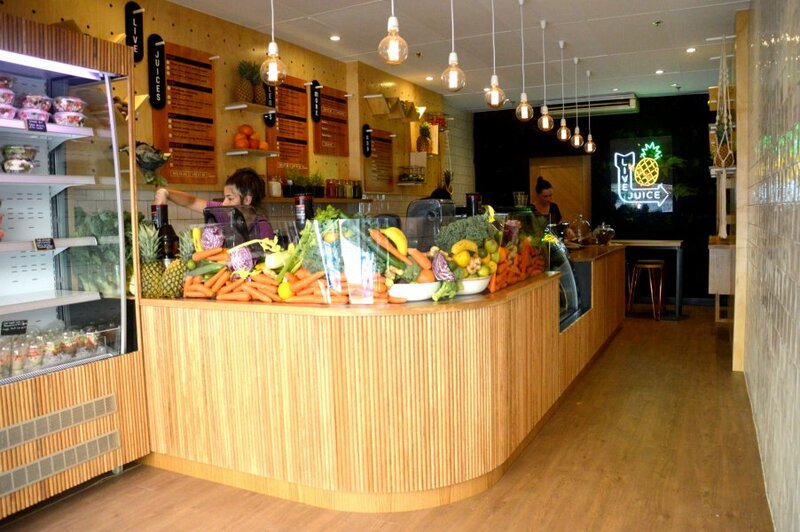 I’m glad to say that this place ticks all of those boxes and is your one stop shop for all things healthy to eat. I can’t help feeling healthier after eating here and am certainly looking forward to my next visit.